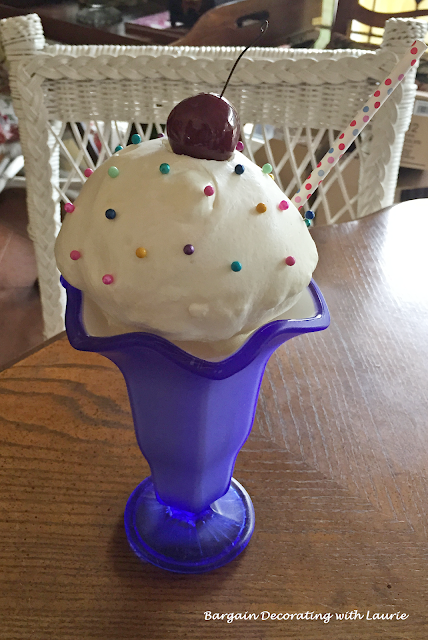 My friend, Audrey, came up with the idea of using ten-ounce throwaway plastic cups to mold faux ice cream for the tops of sundae glasses. Audrey and her daughter, Bandee, filled the plastic cups with spray foam insulation. (I think they were having too much fun to let me spray the foam.) 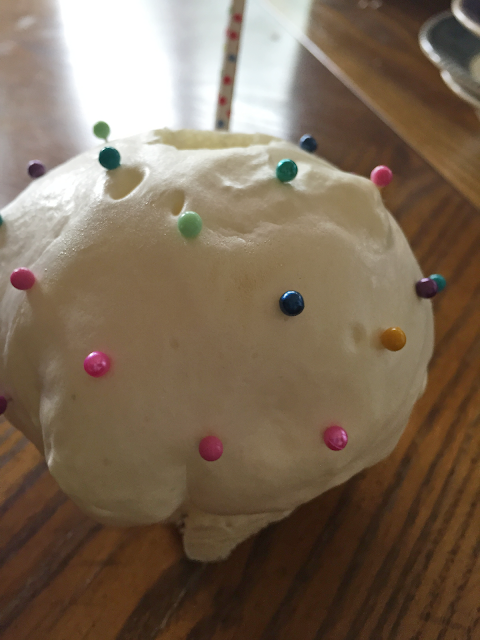 We stuck a straw in the foam while it was still wet and then waited for the foam to expand and dry. 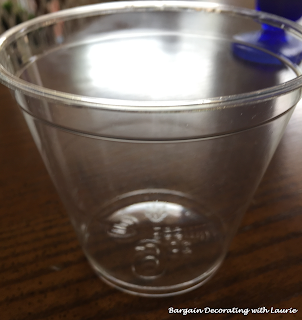 Then we cut off the bottoms of the cups, leaving only the dried spray foam that had expanded over the top of the cup. 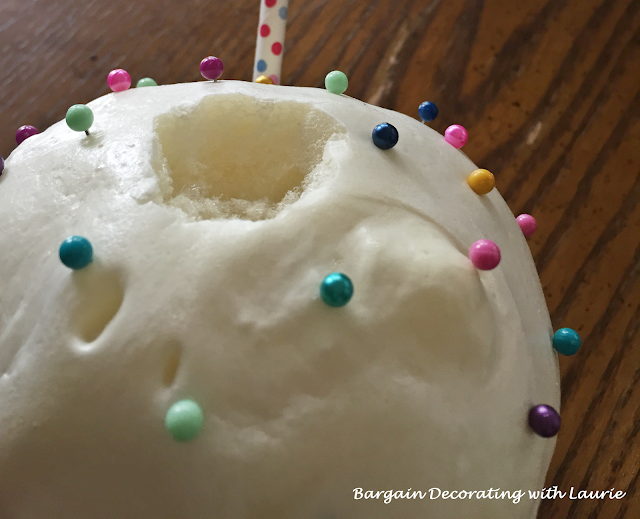 Colored ball point pins imitate sprinkles, and we used a melon baller to create a hole in the center of the foam. 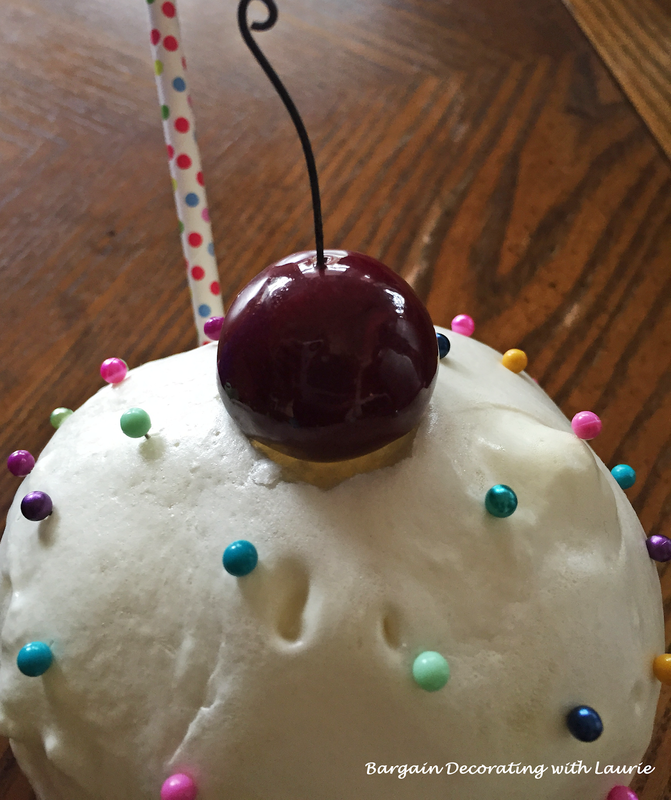 Faux cherries rested in the holes. I topped parfait glasses with the faux ice cream and lined them up down the center of the tables. Guests asked why the ice cream wasn't melting! 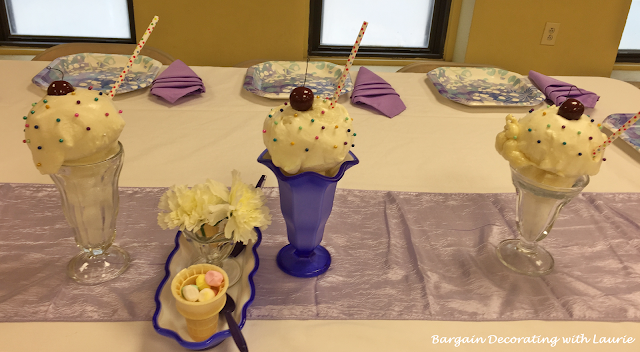 I added footed ice cream servers topped with faux carnations to banana boats and served dinner mints from ice cream cones. I folded lavender colored napkins into an ice cream cone shape. 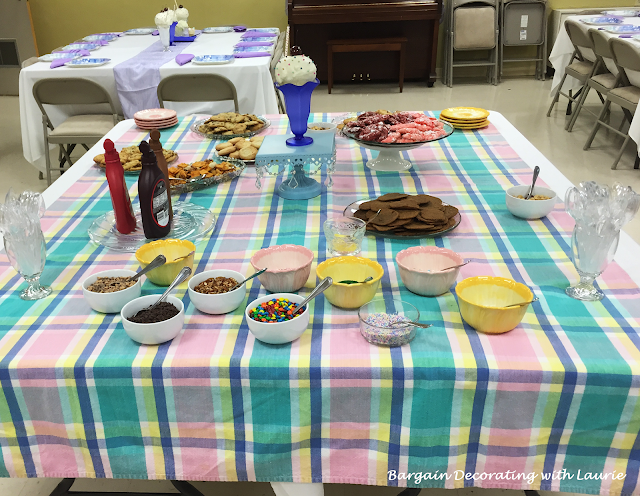 I used a pastel plaid tablecloth for the ice cream toppings and cookie serving table. Some of you may remember that we purchased a shack on the lake. That shack is still a work in progress, which is one of the reasons I haven't found time to sit down and visit with you here at BDw/L. I've missed you. When a local smoothie shop went out of business, I bought some of their stools to use around the kitchen island at the lake shack. They've been in storage for a year, because we haven't put the new flooring in the kitchen yet. I drug them out and cleaned them up for a focal point in the room -- an "ice cream shoppe"
The quilt on the wall was created by women of our church in the early 50's and hangs here all the time. 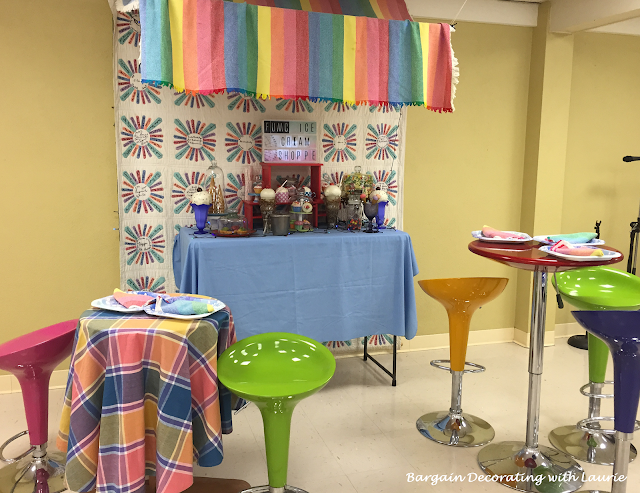 I improvised an awning by attaching a striped tablecloth to the wall and draping it over a curtain rod I suspended from the ceiling. Thank you for stopping by. I've missed your visits. 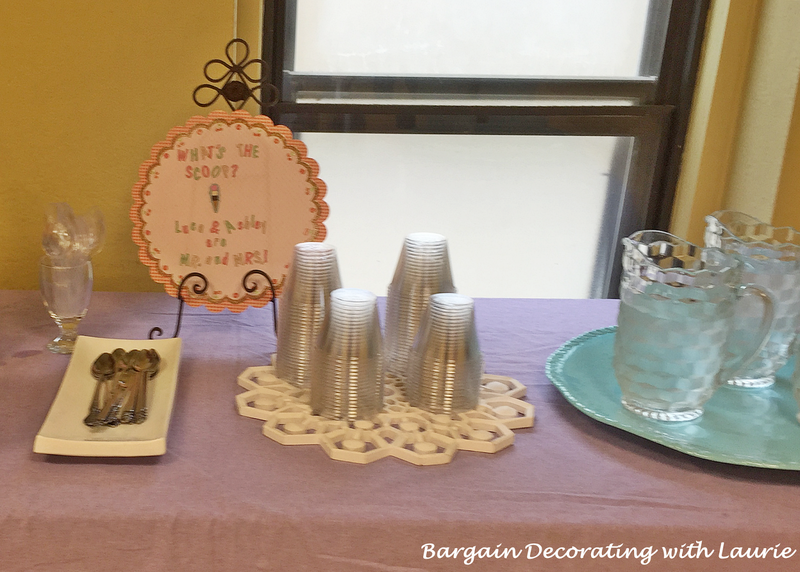 The faux ice cream is such a fun idea! Quite realistic! 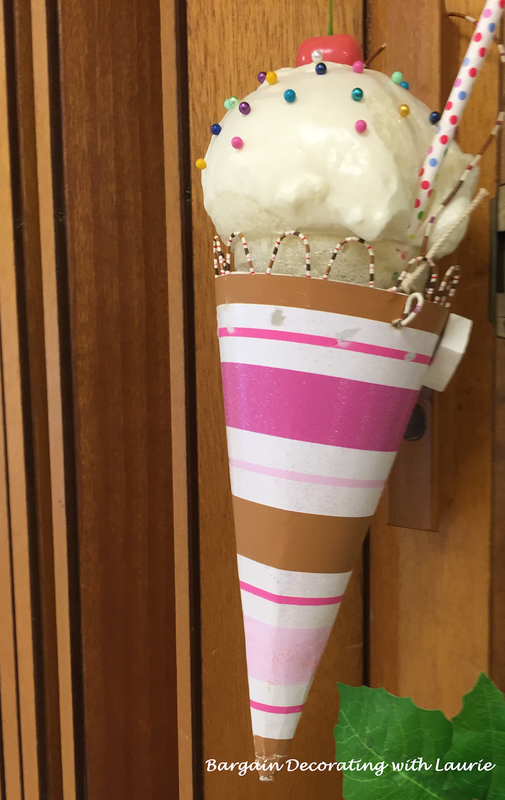 Using the ice cream cones as candy dishes is a great idea. I can see why they put you in charge of decorations! You always do such a great job and are so creative with your ideas. 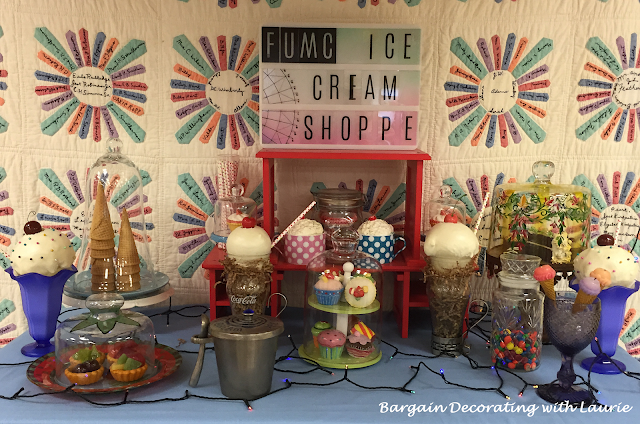 I love the faux icecream, and all the decor really looks like an icecream shop. Love the the stools too. How nice to see your pretty face this morning!